Once you get a kalkwasser stirrer you will never go without one again! Recommended for tanks up to 400 gallons. Avast Marine Kalk Stirrers will continuously mix kalkwasser 24 hours a day. 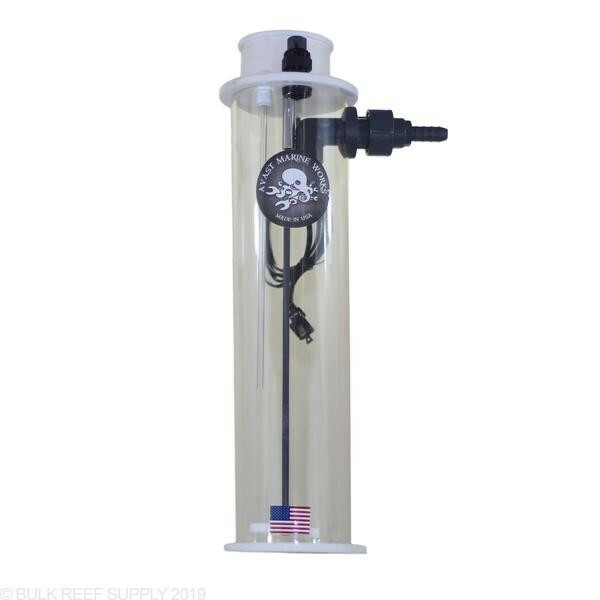 That will ensure the freshest and most potent kalkwasser solution is being dosed into your reef tank at any time. Avast Marine has been producing acrylic based aquarium equipment for years, using high-quality components. 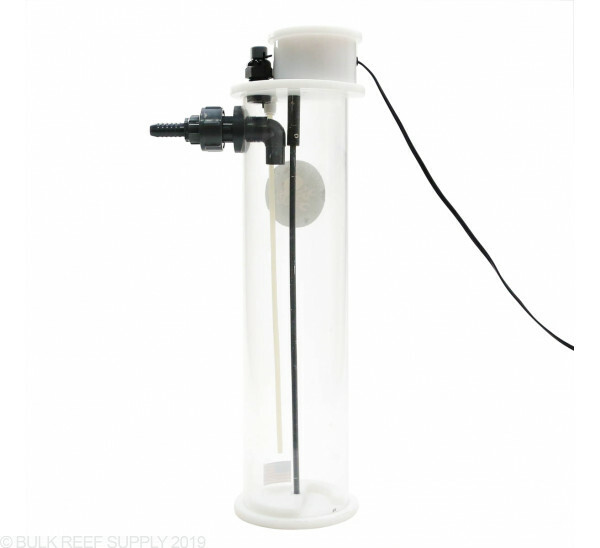 The K1 Kalk Stirrer is a dedicated reactor for dosing kalkwasser into reef tanks, in a safe and controlled matter. Instead of using a large reservoir of lime water, a kalkwasser stirrer can be connected directly to any freshwater reservoir, or even RODI unit saving you mixing time, and space. The K1 Stirrer is designed to stir the kalk slurry 24/7, and does not require any additional mixing pumps or timers. Constant mixing allows the K1 to always have a steady concentration of kalkwasser solution available for your reef, aiding in keeping your calcium and alkalinity levels steady. Some reactors require on a pressurized chamber where the Avast reactors do not. They rely on gravity draining, which is much safer and reliable. Pressurized reactors are prone to leaks which can easily damage and stain floors, which makes the K1 Stirrer a no-brainer. Kalkwasser (Kalk) is calcium hydroxide and when mixed with freshwater becomes a magical solution that can add calcium and alkalinity to your reef aquarium in balanced proportions. Calcium hydroxide is commonly used in top-off reservoirs or in a kalkwasser reactor and then slowly added to the tank multiple times a day. As kalkwasser is added it will help replenish calcium and alkalinity that your corals will consume but also slightly increase your pH for a short time. Due to the pH increasing effect, care does need to be taken that the solution does not get overdosed and that your pH is not increasing more than 0.20 pH per dose. What do I need to use the K1 Kalk Stirrer? 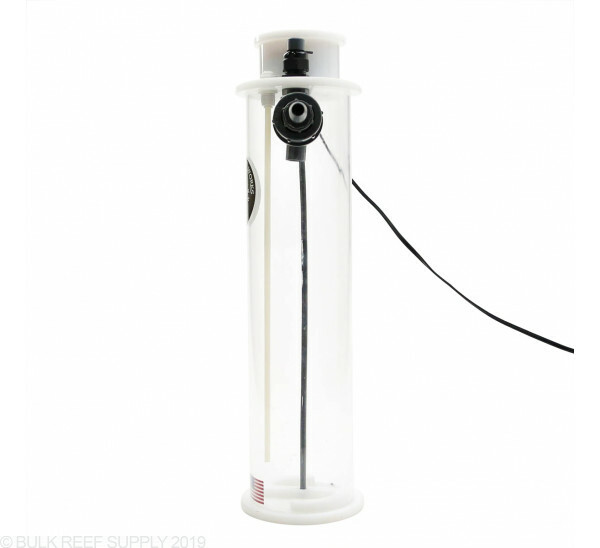 You will need a couple additional accessories with the K1 Kalk Stirrer, one of which is a feed pump. 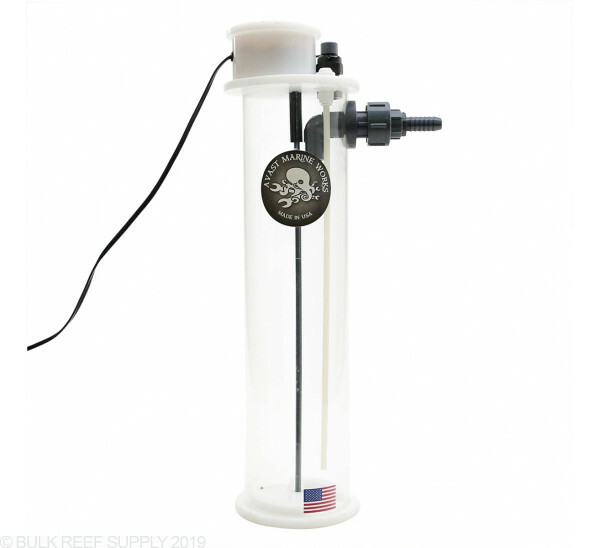 In most cases, a peristaltic pump will be the best solution for the benefit that they are very accurate and also have anti-siphon characteristics, but inexpensive pumps like an Aqualifter can work just fine, but care does need to be taken that it does not back-siphon. It is much safer to feed a kalkwasser reactor from a reservoir that contains RODI water, than a direct connection to a RODI system. In most cases, the refilling of the reservoir can be automated and more efficient. The drain barb uses 1/2" flexible tubing and will allow the reactor to drain into a high-flow area of your sump. We have found the Black Vinyl Tubing to look very nice with the Avast Marine reactor. Another requirement is kalkwasser itself, and you can choose your favorite brand of kalkwasser. We suggest using BRS Bulk Kalkwasser and if you need to adjust your levels you may want to get the BRS Kalkwasser Starter Package which includes calcium, alkalinity, and magnesium supplements too. How much Kalkwasser do I use? The amount of kalkwasser reactor used will vary from aquarium to aquarium and will depend on the amount of water your tank evaporates per day, and also the demand for calcium and alkalinity. Please refer to the chart at the bottom of the page for starting recommendations. Once every two weeks, the kalkwasser solution in the K1 will need to be replenished, but only rinsed out once a month to make room for new kalkwasser. Since kalkwasser can help purify the freshwater that is fed into the reactor, the precipitate can form at the bottom that will be removed when the reactor is rinsed out. Rinsing the reactor only takes a few minutes and with the included union barb and push connect fitting, it is very simple too. It is also suggested that once every 6 months the reactor is cleaned with vinegar to help remove any calcium build up or deposits. You will need to determine your aquariums evaporation amount on a daily, weekly, or biweekly basis, and then follow the chart below for starting recommendations with the Avast Marine K1 Kalkwasser Reactor. If your aquarium evaporates more than 25 gallons per week, it is highly suggested to refill the reactor once a week. If it weren't for the lid I'd give it 5 stars. I would have put it at three stars but for the price I saved over $120 and bought a ziptie and a 1/2" pipe adapter. I've been using this for awhile and love Avast products but the small output constantly got clogged with kalk buildup in no time. Since the lid is not sealed it overflows the chamber and the unit is not in my sump. I removed the barb and replaced with a 1/2" pipe that works much better and is too wide to clog. I also added a bunch of zipties to the shaft, near the bottom, and my kalk production increased so much so that the pH probe has to limit it running and now keeps my pH at a constant 8.28-8.31. A 3/2 solenoid will bypass the reactor when the pH is peaked to keep up with evap. I can now add a pound of kalk at a time. I had an second-hand Deltec KM500 Kalk stirrer that I used until it developed a crack. This Avast kalk stirrer is comparably built (without any leaks), for much less money. I run the motor 24/7. The motor does make a low noise, but not nearly as my Tunze 9410 skimmer or even my Sicce Syncra "Silent" return pump. Those expecting Royal Exclusive or Vertex build quality for $210 should seek alternatives. This is a simple device, with an extruded acrylic body, that is purpose built and effective. I really like that the motor is rated to run continuously, versus others where they state to not run their motors continuously. That alone is why I went with this one. I still don’t run it 24 hours, but like that they use one that can. Apex runs it 30 minutes for every hour, or 12 hours a day. Replacement motors are very affordable too. I hate the barb fitting, and switched it out with a 1/2 push connect instead. The reason this didn’t get 5 stars, is because the union fitting is not common. I bought a BRS 1/2 union for the push connection, but it didn’t work, the threads are different. I bought a replacement union from the Avast site, and got it to work. Their support emailed me back promptly, I’ve dosed kalk a few different ways, this is by far my favorite, and requires the least amount of time. I also use the 50 ml/min dosed with this. If you have a cabinet for your stand, I doubt you will hear this motor. This could have been a good product. The motor they use in this is loud. I would not recommend this to anyone who has a tank in a living room area. Very well built and excellent product. I was never very good or consistent with regular Alk and Calcium dosing and could never keep my tank parameters from swinging. I'm using the Avast Marine K1 Kalk Stirrer with my ATO pump/system, and it works like a champ! My corals and I both love it! I recently bought the Avast K1 Kalk stirrer, arrived looks like it was packaged from the factory. However when opening it, I found out that there was loose stirrer coupling which could not be reattached to the motor stem because the motor stem was loose and not enough room to catch the stirrer coupling and set screw. No parts sheet or any instructions to repair this unit. So what the heck, took a hit to the lid which was hot-glued in place, but now I saw the motor and the problem. One of the two nylon 10-32 screws was sheared off, and laying beside it. Totally frustrated at this point, drilled out and re-tapped mounting hole, bought a couple of stainless screws and remounted motor and reassembled the kalk stirrer. Just think, all of this mess for just $210, what a steal. Made in America - oops! HIGHLY Recommend keeping your PH nice and stable! I run with a BRS Top Off Doser - 50 mL per minute pump and my TUNZE ATO! I still have slight swings during the night but nothing under 8. Also, tell you what, watch out for this American Made - company that makes insane QUALITY products!!! Can this be run both in sump and external, and if so, what is recommended? 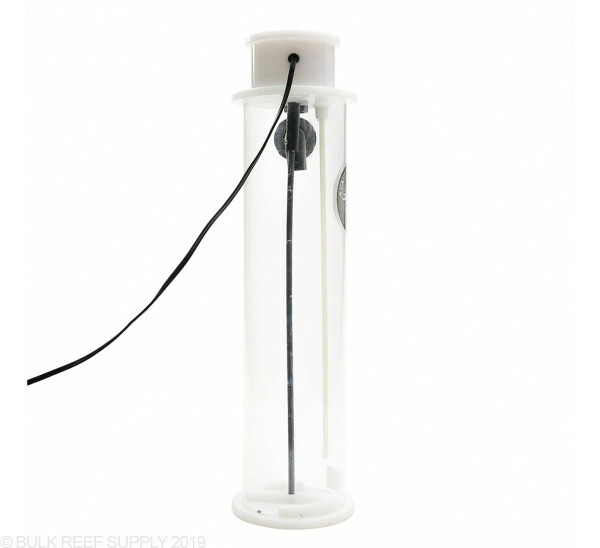 We recommend using these stirrers externally and we recommend having the outlet barb higher than the lip of the sump so the water can flow from the reactor to the sump. Have a great day! 1. 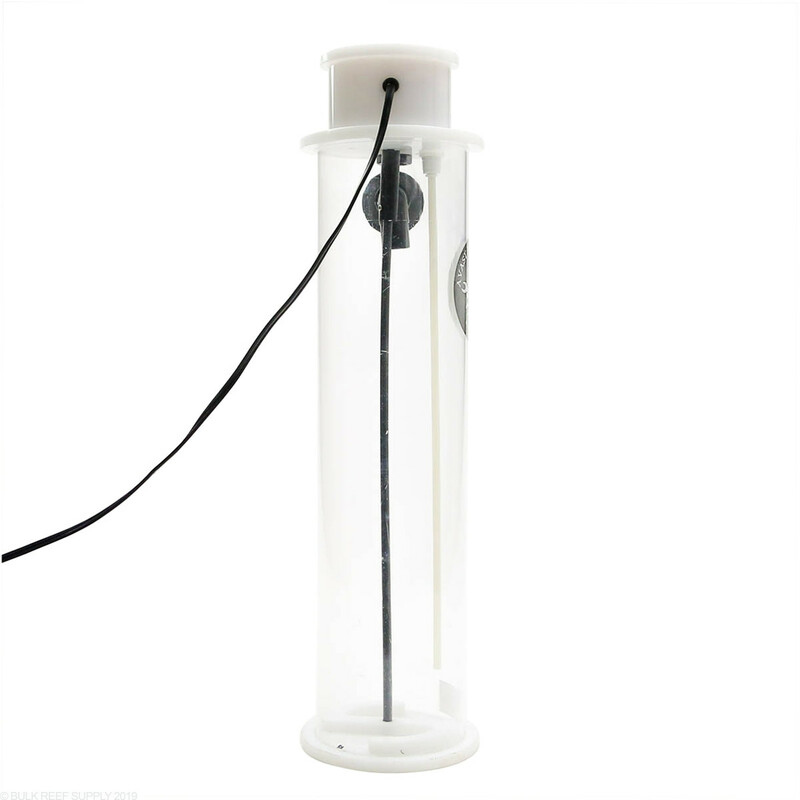 Can a pmup be used to feed this stirrer? 2. If not, if I use a aqualifter instead, can I still hook the output to the ATK? My brief calculations indicate that answer to question 1 is no, and 2 is maybe. Any real world experience? The PMUP would actually be an ideal pump. 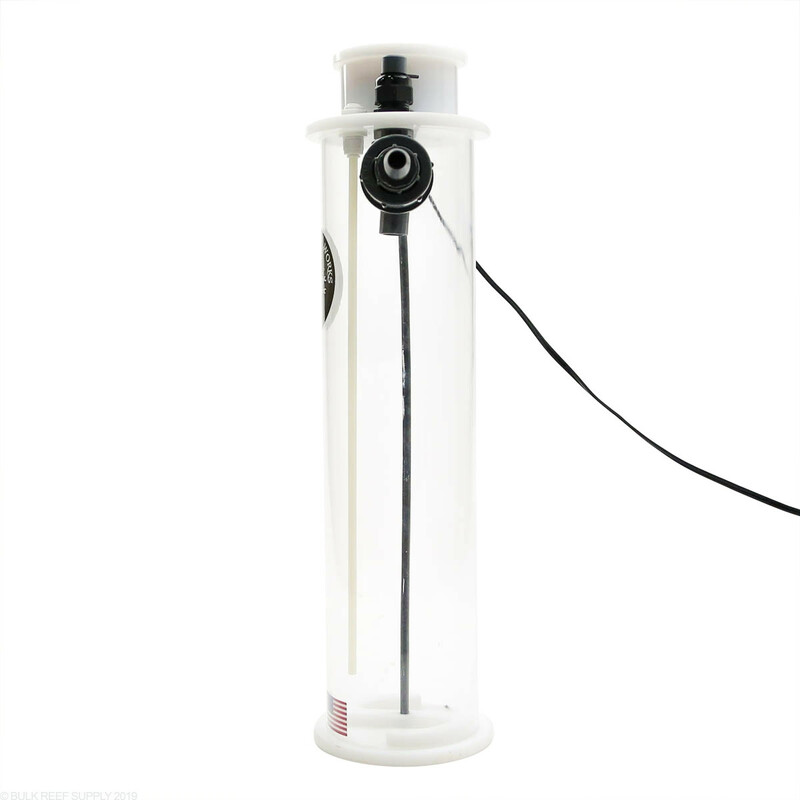 The already use 1/4" push connect tubing, and with a 1/4" inline ball valve you would be able to control the flow of water through the reactor and make sure it is not too much. The Aqualifter will work, but honestly is not a great solution for a kalkwasser reactor.